Most people think of veterans benefits as being only for servicemen and women who were wounded or disabled while serving in the armed forces. By and large, that is true. But there are substantial benefits that may be available to wartime veterans who are now senior citizens and are facing the burden of long term care due to a host of diseases such as Alzheimer’s, Parkinson’s, MS, Lou Gehrig’s Disease, and many others. 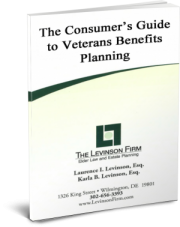 In fact, the Veterans Administration estimates that millions of wartime veterans and their spouses may be eligible for Special Monthly Pension benefits, and not even be aware of it! Wartime veterans, or their surviving spouses, become eligible for the Special Monthly Pension benefit when they are over 65 years of age, are permanently disabled and unable to work, are homebound, or need the regular aid and attendance of another – whether at home, in assisted living, or in a nursing home. The program is based on actual financial need for assistance, so there are income and asset limitations. Our lawyers know how to help in a crisis, and we encourage you to contact us for help. The maximum benefit available can provide significant help in paying for long term care costs, either for the homebound and/or nursing home veteran or surviving spouse. Whether you are trying to determine whether or not you may be eligible for the benefit or just have general questions about the program, please contact our office to talk through your situation and we will figure the appropriate next step. *Note: A professional must be VA accredited in order to assist someone in filing a VA claim. Please visit https://www.va.gov/ogc/apps/accreditation/index.asp for verification.